Hello! I am Paddy, your digital memory assistant. Who are you? Nome particolare il tuo.. o mi prendi in giro? Ridimmelo, mi fido. Ottimo! Allora non perdiamo tempo con spiegazioni superflue e iniziamo!<br><br>Scrivimi la tua e-mail e ti invierò subito un link personale per iniziare a salvare e valorizzare i tuoi ricordi in modo del tutto nuovo. E-mail inviata! ;) Se tarda ad arrivare puoi iniziare la procedura di avvio cliccando sul bottone che trovi scorrendo in basso la pagina!<br><br>Ti auguro di custodire e valorizzare un sacco di bellissimi ricordi. Scrivimi la tua e-mail e ti invierò subito un link personale per iniziare a salvare e valorizzare i tuoi ricordi in modo del tutto nuovo. E-mail inviata! ;) Se tarda ad arrivare puoi iniziare la procedura di avvio cliccando sul bottone che trovi scorrendo in basso la pagina!<br><br>Ti auguro di custodire e valorizzare un sacco di bellissimi ricordi. Ottimo! Allora non perdiamo tempo con spiegazioni superflue e iniziamo!<br><br>Scrivimi la tua e-mail e ti invierò subito un link personale per iniziare a salvare e valorizzare i tuoi ricordi in modo del tutto nuovo. Saving your memories is now easy and fun with Paddy, our Telegram bot! Simple and quick. 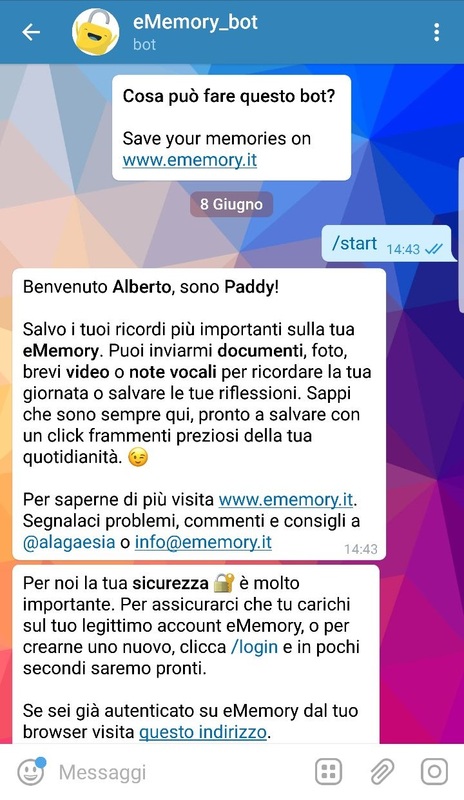 The eMemory Telegram bot, Paddy, helps you save and organise all the pictures, videos, documents, texts and voice messages that you will send it. Activation is easy and safe. Using it is even simpler: it will feel like chatting with your own secret diary or your digital best friend! 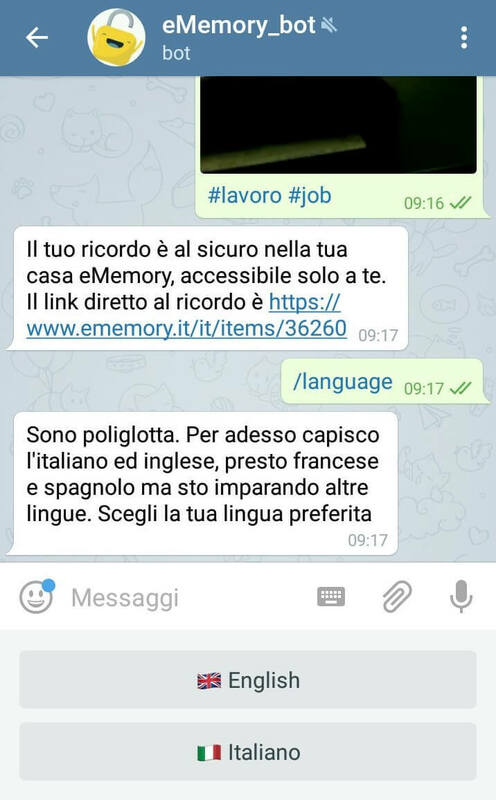 Why is the eMemory bot on Telegram? We chose Telegram because it is one of the safest, quickest and most practical instant messaging services available. Moreover, because eMemory does NOT promote the use of personal user data for commercial and advertising purposes. Telegram is distributed as a freeware by Telegram LLC, a non-profit organization. Its policies about data privacy appear to be consistent with eMemory values. This is why we have chosen to entrust Paddy, our bot, to Telegram, in order to offer you an experience with the highest standards of security and confidentiality. If you do not have an account, registration is free and easy! 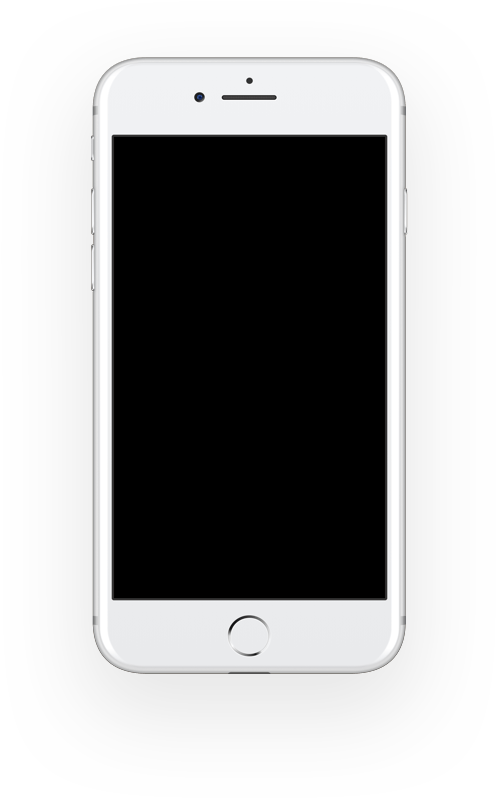 Once you have added @eMemory_bot to your chats, you will be able to let it know how you feel, write down important things to remember, send pictures or videos to save the most valuable and meaningful moments of your day. Enhance all your shots. More than selfies: your pictures of landscapes, people, food and much more. Attach your photos and keep them safe in your digital home. We support all kinds of documents. If you write just a simple message, Paddy will save it as a diary entry. Do not send your voice messages just to your friends! 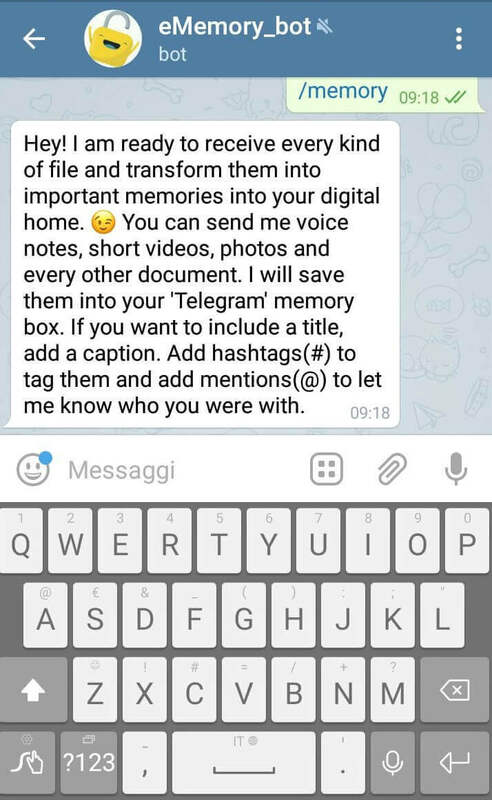 Send them also to Paddy, your digital memory assistant. The rhythm of your life is in your audio-tales. With our bot, you can quickly save them in your eMemory digital home and keep them forever. Relive the moments of your life you captured in a video every time you wish! If you send a video to Paddy, you will find it saved in your 'Telegram' folder with the other data uploaded through our bot. Memories are as important as the people who shared them with us. While you upload a memory, with our eMemory bot you can tag the @people who were with you. #Concepts, #topics and >places are important to give a context to your memories. They also help you organize them and view them as you wish. With our eMemory bot you can tag your memories and describe their context by attaching a simple message. 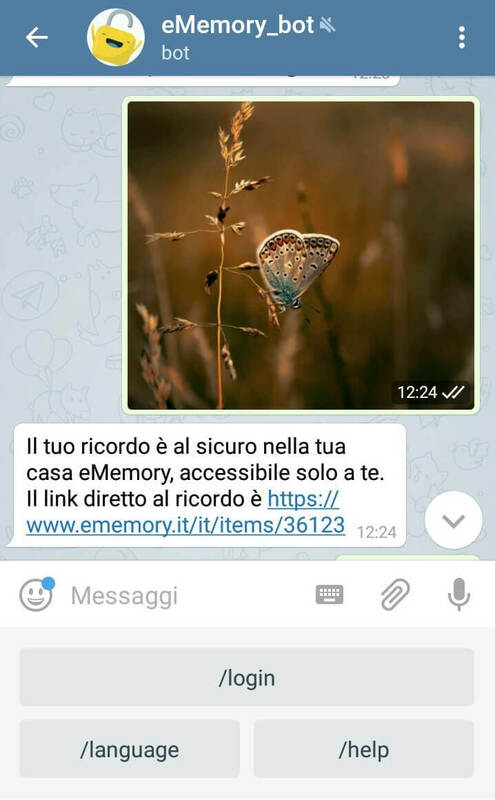 Check our eMemory channel on Telegram to find interesting news and join discussions about digital memory, security and privacy. Words are not enough... Try it now! A bot is an automated assistant devised to make certain actions and activities easier and faster. Our eMemory bot, Paddy, helps you organise your memories safely and quickly. Once you synchronise it with your account, it will use a Telegram chat to write and answer you. 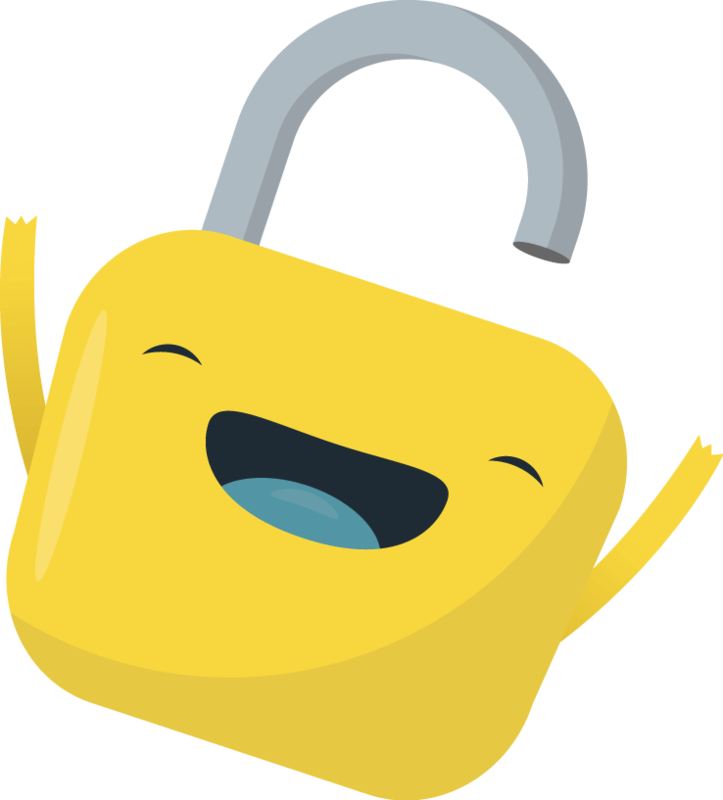 Our bot will receive every kind of content you choose to send (images, videos, audio files and even short texts with your thoughts) and will save it in a new Telegram folder.